Last summer I was lucky enough to be invited to a quite remarkable weekend…The Great Feast of Michaelmas of the Men of Armes and Galaunt Dedes. It was a bit like a dinner party, but the dress was more early middle ages than your average dinner suit. Not only was the company and the feast totally overwhelming, but there was a hectic schedule of archery, falconry, jousting and tilting, and fighting with broadswords. Needless to say I was better at the feasting than the fighting; but it was all great fun and always good to spend time with people passionate about their pleasures. Anyhow, one of the guests at the weekend was Tobias Capwell, Director of the Wallace Collection (just go and see it…) and one of the country’s leading specialists in all things gallant and marshal metalworking. 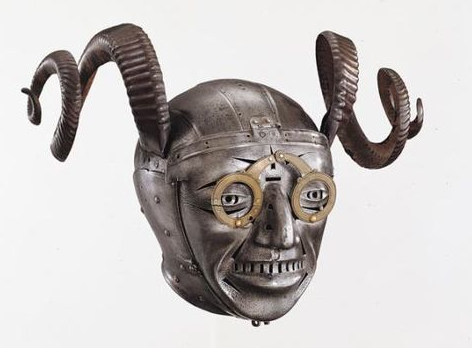 He has been presenting a BBC 4 documentary celebrating the age of armour, that tells how Henry VIII fused German technology with Renaissance artistry to become the image of the perfect knight. It’s available on BBC iPlayer right now; follow this link The Knights Tale. I am not too sure about his description of “armour that tries to seduce you,” or the somewhat odd quip that “this is what Elisabeth would have looked like… If she were a man.” But his mastery of the subject is impressive, as are his skills on horseback… the image above is from the weekend. One last thing… do check out the images of the famous ‘Maxamillian Gift Armour’… quite stunning, and testament to the craftsmanship of the age, the Emperor’s regard for Henry VIII, and personal humour.